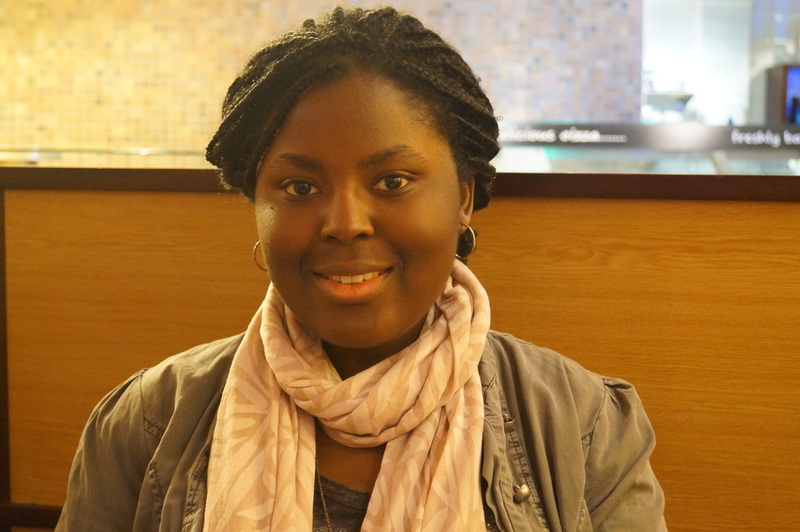 Meet Tomi Makanjuola, the creative voice behind the blog The Vegan Nigerian. Tomi launched The Vegan Nigerian in 2013, giving visitors hungry for culinary adventure the chance to experience the food and culture of Nigeria through a vegan lens. Tomi lives in the UK, but carries the spirit of her country of origin in her writings and recipes. Here, she shares her story and unique perspective on living authentically and compassionately. Tell us about your childhood. Where and how were you raised? I was born and raised in Lagos, Nigeria--a thriving, bustling metropolitan city where there is never a dull moment. From the heaving traffic to its determined inhabitants, Lagos was a stimulating and exhilarating place to grow up. Much of my love for the "big city" comes from living in Lagos for over half my life. I have fond memories of my early childhood. I have loving parents who made sure we never wanted for anything, and we were raised in an environment where creativity was encouraged. It was in Nigeria, at the age of 10, that I developed an interest in cooking, and at the age of six that I started writing. In your “vegan awakening” story, you describe events that prompted you to rethink your native culture’s attitudes toward animals. Can you tell us more about Nigerian culture? Nigerian culture is extremely diverse, as there are so many tribes existing within that one country. However, there are similar aspects and principles; for example, respect for tradition and family. The family unit is undoubtedly an integral part of the community, and in the realm of food and cooking, meals are important for bringing everyone together. Food has the power to make or break gatherings, parties and events, and so a lot of special attention goes towards that. Unfortunately, the amount and quality of meat tends to be part of the criteria for what makes a successful event, and this attitude is evident on a smaller scale across the country. Meat is seen as a sign of affluence, and many Nigerians will tell you that "no meal is complete without meat." Nigerian culture is also about celebrating abundance, and I think that if more people celebrated the diversity of plant foods available, there can be a cultural shift in the way we value food. Do you still have family in Nigeria? Since launching The Vegan Nigerian, have other vegan Nigerians reached out to you? Absolutely! I’ve received emails from a few other vegan Nigerians, some of whom are now good friends. It was interesting to discover that there are other Nigerians who have been vegan for much longer than I have--I’m talking 10 years and more. When I first went vegan, I had no idea that other Nigerian vegans existed, and the feeling was somewhat isolating. 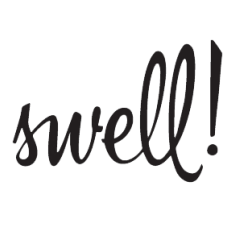 The power of the internet and a direct consequence of starting my blog is that I am able to connect with like-minded individuals. What are some of the first Nigerian dishes you attempted to veganize? One of the first was efo riro, a rich spinach stew traditionally accompanied with meat and eaten with eba, pounded yam, or fufu (see sidebar). I kept the essential plant ingredients, and it tasted just as good as the regular version. It was fascinating to see how the absence of meat didn’t really affect the flavor. As long as I retained the iru and seasoned it well, it was just as enjoyable--and even more so, with the addition of chunky vegetables such as eggplant and carrots. Besides blogging, you have also written a novel. Tell us about your other published works! Before my obsession with food and recipes, there was writing. Growing up, all I ever wanted to be was a writer, and that will always be at the back of my mind. I wrote my first novel in my final year of university (where I was fortunate enough to study a vast range of English and French literature). The novel was written within the tight frame of National Novel Writing Month and I found that it gave me the structure and discipline I needed to complete the task. I’d written other stories and novellas before then, but none that I felt compelled to put out into the world. Completing this novel brought a great sense of achievement and joy, so I decided I would go ahead and publish it. Dear Junia is an epistolary novel that centres on a young, Nigerian female protagonist who writes letters to her imagined future child. It’s an introspective story that deals with themes of parenthood and identity. I am nearly done with my second novel, which has the working title of The Lipstick Preacher, and my hope is to publish it in the first quarter of 2016. Along with fiction, I’m determined to publish recipe books as well. I currently have a short booklet of vegan ice cream recipes in print called Nice Cream: 25 Delicious, Dairy-Free Recipes. What other dreams do you have for the future? When it comes to writing and food, I would like to get involved in as many creative projects as I possibly can, collaboratively and otherwise. I would like to be a prolific writer of fiction, while publishing a series of cookbooks and establishing a career as a chef. My wish is also to develop a restaurant concept at some point, showcasing the beauty of Nigerian and vegan cuisine. I’d like The Vegan Nigerian to have more of a social impact in the future and I have this crazy dream of developing soup kitchens in different parts of Nigeria where it’s needed, offering healthy, nutritious meals. Life’s too short to not dream big and take small steps towards achieving your goals. If you had one free day and money was no object, how would that day look like? Oh, wow. Well, one day isn’t enough to travel around the world, so that’s out of the question. Seriously though, I’d probably visit all the vegan restaurants I’ve been meaning to try out and sample their menus, taking notes as I go along. With a large sum of money at my disposal I’d also secure a property in a prime location and fit it with everything I need to get my own restaurant started. What words of wisdom would you offer other women who dream of making a difference in the world? Live what you preach. Without doubt, words are very powerful, but to really influence others you need to lead by example, and a lot of the time it is by "doing" that you can truly make the most impact. Also, try to maintain positivity in your life, because from there springs the hope, determination, and strength needed to make a lasting difference. Blogging is just the beginning! Tomi is also an accomplished fiction writer, recipe developer, and vegan visionary with exciting plans on the horizon. "Nigerian culture is about celebrating abundance"
What's in a (Nigerian) Name? 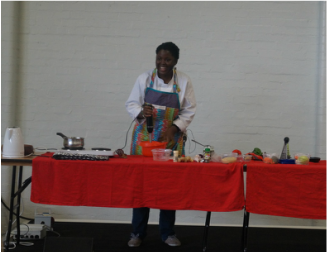 Tomi's cooking demo at London VegFest 2015 featured Jollof Rice, a popular West African dish made with rice, tomato, peppers, and spices. "Words are very powerful, but to really influence others you need to lead by example"
I’ve been using coconut oil or shea butter on my skin for the past three years and those are the only moisturizers I swear by. I love simplicity and I’m all about feeling as comfortable as possible. On an average day, I’m dressed in something super casual like jeans and a blouse, or a simple dress with leggings. Anything with ginger is a winner for me. "Life’s too short to not dream big and take small steps towards achieving your goals"